BGL Basics: How Do I Use the Map to Track Deer Movement? Here is the fun stuff. Once you start accumulating data you can begin to query for trends in deer movement based weather patterns, moon phase and rut phase. By default, the map on your Camp Home will show ALL movement with no parameters. 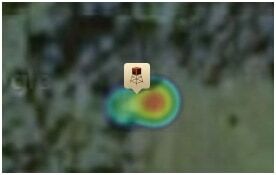 It displays the data by using heat map technology. The most deer movement is denoted by a white hot center. The next hottest area is denoted by Red and then the obvious blue denotes the cooler area. If there has NOT been activity in a particular area the map will NOT display any color.